Remove bug guts safely and in less time! Safe to use on glass, paint, PPF, coatings, etc. 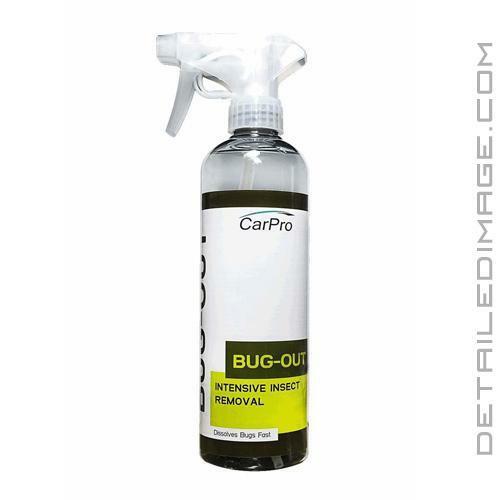 CarPro Bug-Out helps remove bug guts and stains from your paint quickly and easily. When driving it is inevitable, you will eventually hit and splatter bugs on your paint, glass, etc. The reason this is not ideal is that the enzymes and proteins inside the bugs can harden onto the paint and even etch into the clearcoat if left sitting over time. The key is removing the guts before any etching occurs, as the etching will require a polishing set of some sort to remove them. This is where the Bug-Out comes in handy! After zooming around in your vehicle, grab your bottle of Bug-Out and spray it onto the areas splattered in bug guts. Let the formula dwell for 30 seconds, agitate if needed, and rinse away with your favorite car cleaning soap. For heavy guts, repeat these steps as needed. You will be amazed at how quick Bug-Out removes bug guts, leaving that area clean and ready to be polished and/or protected. Bug-Out is also safe on various surfaces, including paint, clear coat, paint protection film (PPF), glass, coatings, plastic, mirrors, chrome, aluminum, and more! So what are you waiting for, grab yourself a bottle of Bug-Out and remove bug guts safely and easily! Spray on the insect stains. Wait 5-30 seconds to dissolve. Agitate as needed with MF. Remove all residue with RESET or ECH2O. Do not leave on the surface for more than 5 min. Avoid use in direct sun. New products excite me, new products from CarPro excite me more. Bug-Out comes in the same quality packaging we're used to from CarPro and with a great sprayer. The product claims to be safe for use on ceramic coatings and PPFs, both of which my vehicle has. There is little smell from this product so it's comfortable to use wherever. I mist the front end of my car and immediately the bug guts start to run and soften up. I let the product dwell for a little more then the recommended 30 seconds, about 1 minute I'd say. Depending on how tough the bug stains are, a second pass may be needed. Post wash the bug stains are gone and there are no visible ill-effects to the coating or PPF. A little product goes a long way which is a plus. Can't think of any cons at this point. Your customer support is top notch.I recommend your site to any of my friends that need car cleaning supplies.